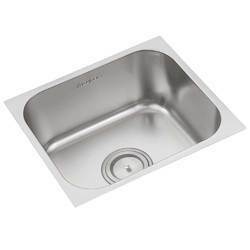 Satinless Steel Kitchen Sink in all sizes and variants. Stainless Steel Kitchen Sink. Available various sizes and variants. Regular Sizes: 13x12, 15x13, 16x14, 17x15, 18x16, 19x16, 20x17, 21x18, 22x18, 24x18, 24x20, 27x21. Single Bowl with Drain Board: 40x20, 36x18, 42x20, 45x20, 36x20. Double Bowl with Drain Board: 54x18, 68x20. Finish Type Gloss,Satin (matt) and Anti-Scratch. Stainless Steel (SS) Kitchen Sink. In three kind of finishes Glossy, Satin (matt) and Anti-Scratch. Available in many size and variants. Square: 12x12, 16x16, 17x17, 18x18, 19x19 and 20x20. Rectangle: 27x21, 24x20, 24x18, 21x18, 20x17, 19x16, 16x14. Single Bowl with Drain Board: 45x20, 41x20, 36x18, 30x20 and 27x16. Doubblw Bowl with Drain Board: 61x21, 61x20, 54x20, 54x18, 46x20.